Make sure your cakes and pastries rise to the occasion. 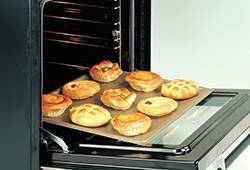 Our electric convection baking ovens can be used to make beautiful bread, perfect pastries and charming cakes. Our freestanding baking oven provides reliable, even heat distribution to ensure your baked goods always turn out rich and delicious. Crafted from heavy-duty stainless steel, this fan-assisted oven is perfect for baking cakes, pies, cookies, breads and pastries. A robust and efficient addition to your bakery, hotel, commercial kitchen, café or home, our range features a toughened, double-glazed window to allow easy supervision of your tasty foods as it cooks. Our baking ovens have a maximum temperature of 300ºC and time settings to allow cooking times of 120 minutes. With the ability to create a host of baked food at once on the 4 heavy duty baking trays provided, this oven is ideal for a commercial business or a show stopping treat for a home baking enthusiast.